Selecting a new Learning Management System (LMS) is a strategic decision. The LMS is a key part of your institutional culture and shapes not only the student experience but also the future direction of your institution. This symposium describes the experience from the initial selection phase to early implementation of Moodle in four case studies: University of Waikato, University of Canberra, University of Canterbury and Massey University. The central question explored is: how do you successfully implement a new LMS within a large institution? In answering this question, the symposium compares and contrasts different models and approaches to successfully implementing such an important educational innovation and large-scale institutional change. The symposium shares lessons learnt from each university and offers participants an excellent opportunity to hear first hand about the benefits and challenges of adopting an open source LMS in the university sector. This was an interesting presentation with some useful experiences that were passed on.The experiences by the four institutions had valuable lessons to pass onto any other institution contemplating changing their LMS or VLE. However I do feel that it shouldn’t have been labelled as a symposium. Now though a symposium originally referred to a Greek drinking party, it is now used to describe an openly discursive format, rather than a lecture and question–answer format. It would appear that I am not alone in thinking that the symposium format needs to be rethought for academic conferences. Altogether, our slightly eclectic individual statements/presentations apparently worked as a conversation opener. There was clearly interest in the over-arching theme and present ASCILITErs were eager to chime in an voice their opinions. However, when things just started to get somewhat interesting we already had to wrap up the session and disperse the convention. I found this extremely unfortunate. I can easily imagine to simply start with a conversation among a group of informed peers on stage… that gradually draws in more and more participants. It would provide a hyperlink-cloud around the individual contributors to get an idea of where they are coming from, and possible end with recommendations on further readings… plus some form of mediated conversation and exchange beyond the event. No presentations, no lecture halls, no 60 min time-slots. When I was planning the original VLE is Dead symposium at ALT-C 2009 one of the key issues for me was to ensure that the delegates attending the debate had ample time and opportunity for discussion. Well the first thing we did was get the discussion going well before the conference. The speakers were posting to their blogs with their views. One result of this was that lots of people responded to those blog posts, which continued the debate. At the symposium itself, we restricted the amount of time to each presenter to just five minutes; Josie in the chair was under strict instructions to stop us after five minutes. I also wanted the presenters not to use PowerPoint, though in the end some presenters did use them. As a result we had a wonderful debate looking at a range of issues, allowing delegates an opportunity to ask questions, voice their opinions and join in. 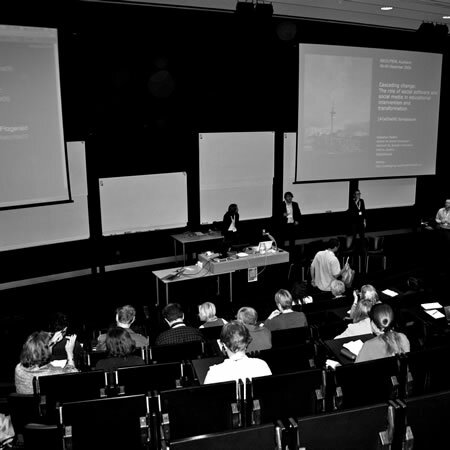 Well our symposium worked very well, with a room for 80, we had 150 delegates in the room, and about 200 online. I recorded the debate and that video has now been seen (at the time of writing) by over 1500 people! So what can we learn from this, especially those that are thinking of putting in symposium submissions and conference organisers. If you can’t get your viewpoint across in five minutes then you just need to try harder. Likewise I wouldn’t have more than four presenters for an hour debate and no more than six for a ninety minute session. Don’t try and cover “everything” try to keep to a single or simple viewpoint. Start the debate early well before the conference. Get the presenters to blog their viewpoints. Encourage others to debate the issue using their blogs. Use Twitter to get the debate going. If you can stream your symposium over the internet, use a service such as Ustream. Use Twitter to cover the debate and if possible have a Twitterfall type service showing during the debate. So ask yourself the next time you consider running a symposium, are you interested in the debate or are you only interested in presenting your point of view. This entry was posted on Wednesday, December 9th, 2009 at 4:27 am and is filed under altc2009, ascilite09, symposium, vle. You can follow any responses to this entry through the RSS 2.0 feed. You can leave a response, or trackback from your own site. We are due to roll out Moodle on, wait for it, April the 1st. So currently interested in other peoples experiences. Are you aware of any resources I can get my hands on from this series of four presentations with a few questions at the end? We have been moving from Blackboard to Moodle over the last twelve months. Our experience has shown that it is an ideal time for staff to evaluate older papers that have been running for a number of years to have a fresh start. Most staff now are moving away from the dumping culture and really looking at the tools that Moodle has to offer. At last! One thing it taught us, ensure the training and support is there and keep sending the message out in plenty of time. We are still getting requests for help in moving materials and we close next week! I think that your idea of less is more is good James. We only remember a tiny fraction of what we hear – but a whole lot more of what we take part in – so we should introduce > challenge > facilitate. This way everyone feels as if they have taken part and feel like they have contributed. The problem is that they may then reflect upon the session and ask themselves what they learned. Did the ‘symposium’ fulfill their expectations? or (harder to facilitate), did all participants have a different expectation/need? It takes a really focussed leader to make sure everyone is happy. Nice to hear you got back safely. I strongly encourage you to persist with your approach as I am sure the forum will grow stronger and those involved will get much greater benefit from their invested time.